MANILA, Philippines- Following the face off of Sen. Antonio Trillanes IV and Mayor Rodrigo Duterte’s lawyer Atty. Salvador Panelo at the Bank of the Philippine Islands (BPI) Julia Vargas branch on Monday, May 2, a netizen has disclosed a supposed technical explanation of a BPI Information Technology (IT) Data Mining officer to shed light on the issue. A certain Irish Burgos Junasa has shared her supposed conversation with an unnamed BPI IT officer on Wednesday, May 4 in her Facebook account. Junasa’s contact explained why it would take seven days for the bank to disclose Duterte’s bank account details. In exchange for the bank secrecy waiver of the tough talking Mayor of Davao City, Trillanes signed a waiver containing information on how he got the details on Duterte’s BPI accounts which allegedly contained P211 million and P2.4 billion in transactions. But instead of presenting the promised waiver, Panelo submitted a special power of attorney from the PDP-Laban standard bearer to ask BPI for a certification that “at no time since the opening of the account has there been P211 million whether singly, collectively, or cumulatively deposited to his name”. BPI asked for 7 days in order to look into Duterte’s request because of legal issues. As a result, the details will only be revealed on May 11, two days after the 2016 national elections. “The Bank system can only show up to 6 months transaction. Historical transaction has to be retrieved in the data warehouse and will be securely provided through a disk/cd. Thus this delay. However, BPI has already made a public announcement that no amount of 211M is really true,” the BPI I.T. officer allegedly told Junasa. The BPI I.T. officer also revealed that the bank was able to guarantee that no amount of P211 million was deposited into the accounts since the branch can determine the highest amount deposited. Tagging the whole issue as “pure propaganda”, the BPI I.T. 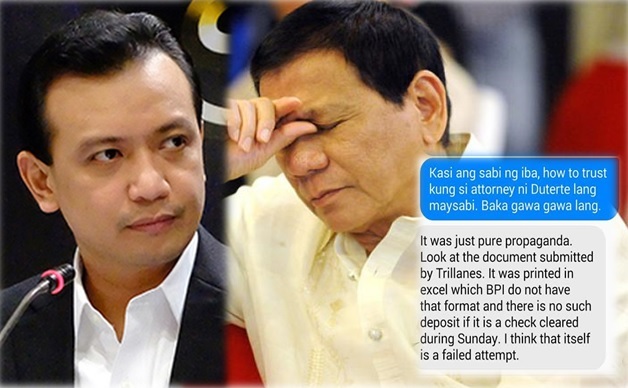 officer reportedly questioned the affidavit submitted by Trillanes. Read Junasa’s full post below.